67/123 David Mumpower Doesn't quite work anyway, but the twist makes it oh so much worse. 75/190 Max Braden Plot sensibility: not great. music: pretty cool. Post-apocalyptic films have traditionally found mixed results at the box office. For every I Am Legend ($256.4 million domestic, $584 million worldwide), there’s a The Postman ($17.6 million domestic, $27 million worldwide). Then there are those that become genuine classics like The Road Warrior, and others that become synonymous with Hollywood excess such as Waterworld. The easiest lesson we can extract from this is that no one really wants Kevin Costner around after the world ends (Cheap shot, I know, but I really wouldn’t want Kevin Costner around after the world ends). One could argue that all of this bodes well for the post-apocalyptic western The Book of Eli, helmed by acclaimed director siblings the Hughes brothers, of Menace II Society and From Hell fame. 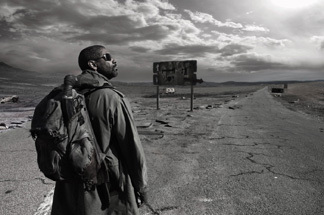 Bringing us the tale of a hero trekking across a wasted America in search of a book holding secrets of humanity’s survival, Eli stars Denzel Washington, Mila Kunis, Gary Oldman, and not Kevin Costner. Washington has been as reliable a draw over the past few years as Costner has been off putting. Just contrast American Gangster ($130 million), Déjà Vu ($64 million), Inside Man ($88 Million), The Manchurian Candidate ($65.9 million), and Man on Fire ($77.9 million) with Costner’s Swing Vote ($16.3 million), Mr. Brooks ($28.5 million), Rumor Has It ($43 million), and The Upside of Anger ($18.8 million). Kunis and Oldman, while certainly not headliners, are coming off stronger showings themselves with Forgetting Sarah Marshall ($62.9 million) for the former, and the mega-franchises Harry Potter and Batman for the latter. As a director, Costner has had better luck. His Academy Award winning Dances with Wolves raked in $184 million back in 1990. But then, The Postman happened. A legendary failure of Gigli proportions, Postman received such acid reviews and anemic box office, it became as infamous an icon of showbiz indulgence as Dances did of showbiz success. Contrast that with the Hughes brothers. While never A-listers in the Costner sense, their smaller films earn positive notices and solid box office, and the duo has developed a respected name in the industry. Menace II Society pulled in $27.9 million against a $2.5 million budget in 1993, and has an 86% positive rating on Rotten Tomatoes. Two years later, their next offering, Dead Presidents, brought in $26.3 million back from a $15 million budget and earned a less impressive, but still solid, 63% positive rating from Rotten Tomatoes. Okay, so From Hell didn’t make back its budget. It still has a small following with the graphic novel crowd. They’re no Spielberg, but the Hughes have never delivered a Postman-style disaster upon ticket buyers. See the latest developments for this project on the The Book of Eli Movie News page.